Well folks, we're here basking in the soothing white light, and extremely ready for whatever Philips has to offer this CES season. Prepare to be blown away, or not blown away. Only time will tell. 12:53AM PT - We've got front row seats, and things are looking and sounding quite dramatic today. We're not sure if we should be laughing or crying. It's emotional. 1:00PM PT - Right on the nose! We're off! It should come as no surprise we're being treated to some intense, arty video of the company's Aurea. 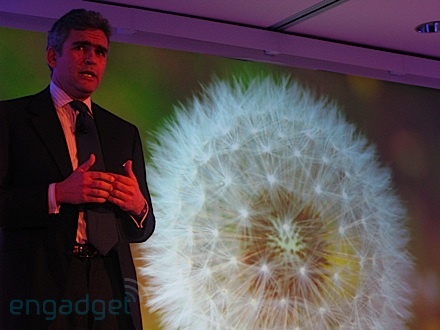 And Andrea Ragnetti, CEO consumer lifestyle has taken the stage. 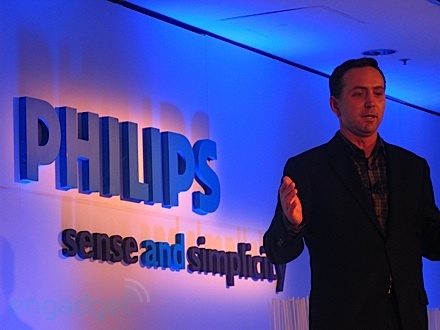 The consumer lifestyle is a brand new sector of Philips -- it combines consumer electronics and domestic appliances. 1:03PM PT - Andrea is telling us that in the past there hasn't been enough focus on consumers. We might agree with that. He considers his work part of a personal journey... we're with you, man. He is talking about how consumers used to not need incremental changes in product lines -- he's a on a very intimate vibe right now. This man wants to bring the joy of experience back to his buyers... probably the joy of spending too. 1:06PM PT - Now he's talking about the Aurea, which he considers the "reinvention of television." Not totally sure about that, Andrea (though they are nice). He really loves these things. 1:09PM PT - They're turning a screen around... looking like a new HDTV, though it's not an Aurea. The bass in here is incredible. We're watching a thrilling video right now -- guess what? It's dramatic. 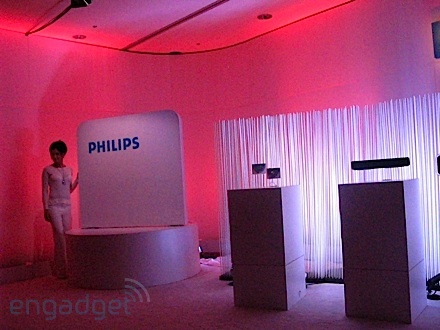 1:12PM PT - Philips is revamping its design, and Andrea is stoked on the clean, simple lines of the new products. He's talking about the role of gender in purchasing products. This is definitely a thoughtful press conference. 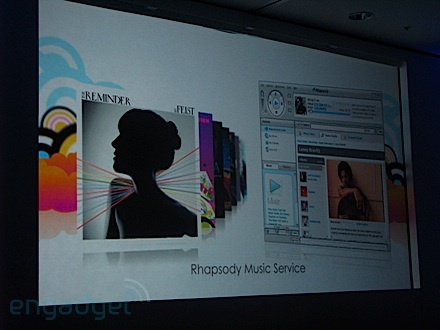 1:16PM PT - Andrea is now talking about the company's partnership with Rhapsody, and online music sales. Matt Rowlen from Rhapsody has taken the stage now. He's touting the company's wide coverage. Now they're rolling a clip made with Lenny Kravitz. It's pretty funky, also, someone is playing the electric guitar. 1:19PM PT - Rhapsody is now (or will be soon) available for Philips devices. Mind blowing. Now Andrea is back on talking about lifestyle and design. 1:19PM PT - Stewart Muller has taken the stage -- he's about to drop some details of the 2008 product lineup. He's touting the Philips Design Collection of TVs and consumer electronics. 1:23PM PT - The new Design Collection TVs will come in the 3000, 5000, and 7000 series, and apparently will feature something he's calling "invisible speakers." Go figure, it makes the TV thinner! 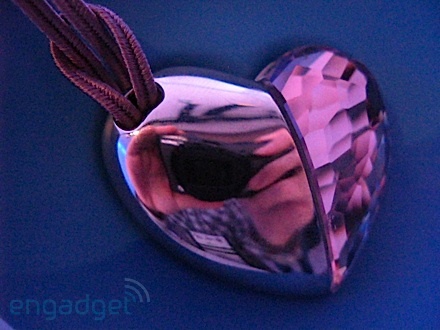 We're sensing a theme at CES this year. He wants us to get up close and personal with them. 1:26PM PT - The company is rolling out some new Ambisound home theater systems. 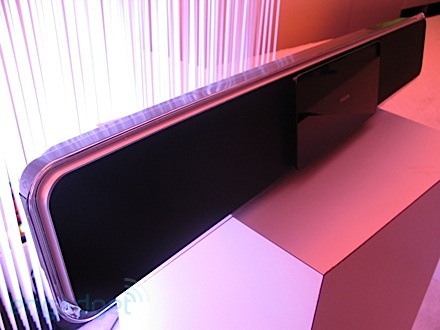 5.1 multi channel surround sound, integrated in a single bar of speakers. New iPod docks equipped with Bluetooth. Wh-oh... talking Blu-ray! 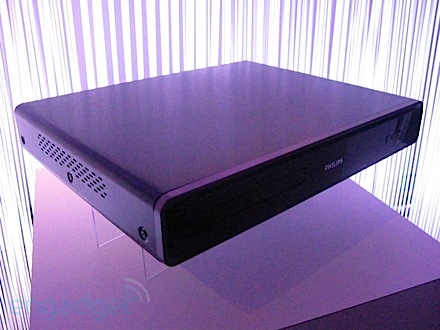 They've got a brand new BDP7200 Blu-ray player. Wow -- Target is going Blu-ray exclusive according to Stewart. That's something. Not totally sure that that's 100-percent official. We shall investigate. 1:30PM PT - He's rolling out some Swarovski USB jewelry -- for some reason people in the back are cracking up. He's made a quip about Valentine's day -- people are loving it. Andrew Goldman has taken the stage for questions and answers! Terrific. That ended pretty quick... and we're outta here!